The Flood, and the Forerunner's own susceptibility. On p. 241 of The Flood, it tells that the flood were kept for future research, and were known as well for their ability to take over other life forms, "even advanced life forms", which implies that the Forerunner(s) could be affected by the Flood which must mean that the Forerunner(s) were a living species, not some robotic creature(s) like some theories have told. What is included in the phrase "advanced lifeforms" that is not covered by merely the descriptive phrase "life forms"? The Flood can only utilize organisms of sufficient mass and cognitive capability (the minimum necessary): Grunts, Humans, Elites, etc. ; life forms. But what is the nature of the possible creatures implied under the expanding adjective "advanced", and do the Forerunner fit into this category? Does this entail cybernetic enhancement or silicon based life, or is it merely a means of distinguishing between Carrier-worthy hosts like the Grunts and Jackals, and more intelligent, viable Warrior/Worker species such as the Elites and Humans? Doesn't anyone find it weird that when Keyes first finds Halo, Cortana knows its called Halo and the planet's name is Threshold with a moon, Basis? This means that Humans have either been there, or seen it through a telescope. And it's kinda hard to miss a gigantic ring between a planet and it's moon. ...On The Pillar of Autumn, when you get to the bridge and see the captain, after talking to him you can look at the screen behind him. And if you look carefully, you can see a schematic of a section of the ring, or maybe its the whole ring, but it definitely is there, and in the small box the schematic is in, the name "Halo" is visible. Now, to memory, the first time we find that the ring is named halo is when we rescue Captain Keyes in T+R. 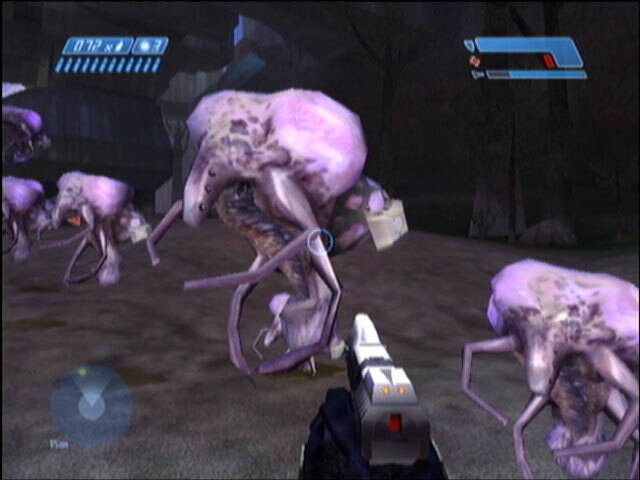 The name "Halo" is derived from Covenant battlefield transmissions, translated by Cortana. A more literal translation would be "Ring of Heaven" or "Ring of the Gods." Halo orbits a large gas giant (Earth Survey Catalogue Number B1008-AG, nicknamed "Threshold"), suspended at the Lagrange point between the planet and its largest moon, Basis." This, however, may possibly aggravate speculation regarding the practical meanings of the name "Threshold"; that it is/contains a "gate", door, portal, etc. What could the Humans have known about this planet and moon before visiting, and without a more extensive knowledge of the system's contents and operations? ::sniff, sniff:: The scent of an ONI coverup? Miranda: A matter of Bungie's vernacular tongue? Rather than looking ahead to new characters that are yet to be introduced, we could probably�find a far more simple explanation for the mysterious Miranda. We know for a fact that the Bungie crew have their own names for each of the levels, and don't even remember the real names half of the time. So couldn't Miranda simply be Bungie's pet name for Cortana? It would certainly sit well with the theme of brutal, painful betrayal. a couple weeks ago i started obsessing over Joyeuse, the third sword mentioned on Cortana's (the swords) inscription "I am Cortana, of the same steel and tempur as Joyeuse and Durandal, and the other sword made by Munification (who made Cortain and Durandana) Sauvagine. Because i'm cool like that. And i also have been wondering if ever a third AI comes into play (sauvagine and cortain both belong to same person). But back to why i emailed you. In my searches for mythological swords, i came across a sword named Mirandoise, a very very famous sword you may have heard of. Its also called Excalibur. It's also suppost to be the only sword equal in strength to Duranadana. Mirandoise just reminded me oddly of our elusive Miranda. Call it a hunch. There was a scene which will go down in the untold lore of Bungie in which Miranda strapped a bomb to the Master Chief's back and shoved him down a hole, and it was this horrible scene of betrayal. Jason was going through a rather difficult breakup at the time - I think that might have had something to do with it. ...So a soldier whose entire unit has been destroyed, his homeworld glassed, appears after apparently being MIA with his ship. He says the PoA has been destroyed by him, that there is a bunch of mutant zombies in a selection of Halos across the galaxy and that there is a mysterious species called the Forerunners who seem to have created their very own method of wiping out life in the galaxy. Oh and there's an AI called 343 Guilty Spark who's practically indestructable. Who else can see the nice medical orderlies coming for dear old Master Chief? Then there's this, which appears to have been sent from someone in the government of Argentina. Socrates adds another possible inspiration for this mysterious future character/casual reference made by Joseph Staten in regards to Jason Jones during the X03 video. Francisco de Miranda was, among other things, a Venezuelan revolutionary. He has been called a precursor (forerunner) to later revolutionaries, such as S�mon Bolivar; Miranda betrayed his cause after suffering some defeat, surrendering himself and the men he lead to the Spanish Imperialist forces. For this, he was arrested by his own men before the surrender could take place, and given to the Spanish, who housed him for the last four years of his life in a dungeon in Spain. A man who was a "forerunner" and a traitor who nearly destroyed the Venezuelan revolution for independence. It sounds strikingly familiar to the Miranda which we know, who, according to the X03 video, straps a bomb to the Master Chief's back and shoved him down a hole. As he goes on to say, this also seems to be another tie in to the history of Mexico, Central, and South America, whose Aztec (and Incan) inhabitants have come up more than once throughout the story's course. About the MC's age that was stated a while ago, 41 could be a good age for military combat. Think about it, in 500 years, humans may be living to like 200 since we are living longer and longer. Many many many years ago, humans ONLY lived to be around 40 or 50. So 41 could actually be young in the 26th century. So many similarities, so little time. The forerunner seem very similar to a race in Iain M. Banks' book, Consider Phlebas. The race is called the Culture and is made up of many different human sub-species. They, like the forerunner seem to, rely on advanced sentient A.I.s to support their civilization. In the book, they live on a vast amount of orbitals (in other words halos) spread all over the galaxy as well as on asteroids and small moons. When threatened, they just shifted the populations and the orbitals. This may be the reason why installation 04 took the shape of a ring, and why a sentient monitor was left in charge of the installation. The Culture's main objective was to keep its residents occupied. It might be that the forerunner kept the flood just so they could give themselves something to do. Maybe the flood escaped in a different galaxy that was occupied by forerunner and because of the outbreak the installations were placed in a galaxy that showed no signs of intelligent life;- our galaxy. Maybe we just managed to evolve in the wrong place at the wrong time. Again, while the thought of our galaxy as a mere buffer zone may initially offend, keep in mind that we, or any other intelligent species, may have not existed to dissuade its use as such. After reading the story summary for Halo: First Strike, I was left wondering something. How, exactly, would there be any survivors still left on the debris of Halo? Here's what I mean: assuming you survived the explosion, and subsequient shockwave, you would have to deal with a little lack of atmosphere. That is, unless each individual section of the ring world had its own life support system and accompyning power source. I guess one could argue that someone could just run inside one of the numerous structures that populate the area and shut the door behind them, and then hope someone comes to rescue them before they run out of air or heat. But, however, not all of the structures even had doors, and the ones that did almost always had the man-sized ones, which, in my opinion, would not make a good barrier against Outer Space. And what about the capacity of the rescue vehicle? I'm sure that the Longsword can only hold so many people. Not to mention the fact that large chunks were sent all over the place, and if there was a time limit before the survivors became non-survivors, the Chief would have to make some pretty quick and ethical decisions about where to search and who to save. Indeed, time is never on our side. With so much debris, how could he ever be sure that there were no other survivors hiding out elsewhere? The difficulty of the decision would only be compounded by the pressures of cargo space at his disposal, the need to find a feasible ride home (that Longsword just will not do), and available time, either of those stranded or because of whoever else may still be within the system. Watching. Waiting. Cortana says that she took down four out of "a dozen Covenant battleships". TWELVE! the Truth and Reconciliation was possibly one of the four she killed (or perhaps an additional one that was disabled), presumably the others floated in orbit or landed. so there can be two possiblities. they ALL landed and were destroyed. or they stayed in orbit, survived the destruction of halo and just blast masterchief into small suitcase pieces in his puny weak longsword. hmm? At the end of Halo, 343 Guilty Spark is shown to be alive, in space. There has been speculation about what he will do now. After realizing that your plan to neutralize the Flood was successful, he would hold no grudge against you, being an AI. It may be against protocol, but the objective was accomplished, and he would quite possibly be grateful for avoiding what is an admittedly messy sacrifice: wiping out all life in the galaxy along with the Flood. My evidence for 343 traveling to Earth is this.Look at the third sound file. It speaks of an easter egg that didn't make it into the game, of 343 paying a visit to the Marine's medical tents, which are, of course, on Earth. Admittedly, it's just an egg, not a major story event, but do you really think that Bungie would put in an egg that contradicted what actually happened in Halo history? Could be a subtle hint, or just plain tomfoolery. Either way, there is little doubt that 343 Guilty Spark will be showing up again in the near future, but just what his standpoint will be on the whole "you blew up my installation" point, considering that the objective of neutralizing the Flood was theoretically still accomplished, could be quite interesting. 343 Guilty Spark says: "a maximum range of...", and this (coming from a program) would mean a variable range, and would explain why he wants you to hurry. The faster you activate Halo, the smaller Halo's weapon's (whatever that is) blast range is. Therefore, less animals (and plant species;) ) are killed. Destroying all sentient life within a variable range surrounding the Halo, depending on the amount of time since the Flood escaped... A far more tactful plan of action. I was playing through Two Betrayals yet again when I noticed something suspicious. Right after you destroy the Sentinals in the Control Room, Cortana says that we have to hurry and destroy the pulse generators, before the Monitor activates "Halo's final weapon." God sent John the Baptist (7) to tell everyone about the light so that everyone might believe because of his testimony. John was not the light, but only a witness to the light. What I'm seeing in my worn out brain is John-117 is NOT the forerunner, but a witness, or an precursor of the forerunner. This can help show about GS calling MC a reclaimer, a forerunner, or descendant of one reclaiming their own facility. The Forerunner seeded the galaxy like it was going out of style. In away I see the Forerunner like a race in a old Star Trek Next Gen episode. In the Star Trek episode the Humans, Klingons, Romulans, and I forget who else, discover an ancient artifact that they assume is a super powerful weapon. They without trust work together to uncover the artifacts mystery and eventually come to a key planet. There they discover that the artifact isnt a weapon but a piece of Ancient(in the cosmic scale) History. A hologram of sorts appears and tells the assorted species the tale of its race; how they had lived so long as the only sentient species in the galaxy that they eventually started to die, as though the species had become genetically stagnant. They then created all the sentient races in the galaxy before they disappeared forever. This is just speculation, but the alpha-numeric equivalent of 343 is CDC. Could this be representative of the Flood's parasitic nature and CDC�as a reference to the Centers for Disease Control? And the Bungie fans come through (at least, one fan does). Less than four hours later, we've got a comprehensive (if a tad opinionated ;-)) description of military rank and insignia. Just had a few comments in response to Weasle's post on the HSP on Nov. 7.� I've never noticed that Keyes is wearing two silver bars in game.� Technically, the rank insignia would be correct if the Halo Universe was using Army, Air Force, or Marine rank structure.� In TFoR,� however, Admiral Stanforth gives Keyes the four stripes and a star of a Naval Captain.� The Admiral is also sporting admiral's stars later on in the book. Too conclude, Captain Keyes should have a little silver eagle on the shoulders of his flight suit to designate Captain.� But Bungie blew it.� Not a big deal.� It all goes to show they should have asked me how Halo should have been done before they went and did it all by themselves. Here's a visual breakdown of today's rank insignia.� Go here. Just wanting to get something off my chest. I find Cortana's choice of words interesting in Silent Cartographer: "....We can't proceed unless we can disable this installation's security system." Cortana instructs you to disable this installation's security system. You do so. A cutscene shows a previously locked door open. But in doing this, did all other locked doors in the installation unlock? More specifically, did Cortana make you unlock every security door in installation 04? "I'll try Sir. But it looks like these Covenant worked pretty hard to lock it down." So how does a handheld door decoder so easily force open a security door engineered by the most advance race in the known universe? Either it contains a dedicated code-breaking AI (of Cortana prowess, no less), or...the Covenant tried to lock it down, but the security system was disabled, and they failed to stem the spread of the Flood. "....no, that can't be. Oh, those Covenant fools...they must've know, there must have been signs!" What signs? Were all the doors in the Flood containment facility wide open, allowing a mass of Rangers to pour out? Perhaps not, but if an Elite or two opened a door and strolled in, the Flood would have found a satisfactory vector or two and used them to open other doors and infest the rest of the facility. Which explains, "We've got contacts...lots of them...but they're not covenant..." Contacts before the apparent release of the Flood by Jenkins and his crew. Many Flood have already found a means to escape. This could provide an explanation for the apparently Flood-infected Hunters in AotCR, though the Flood would have to have spread extremely fast (a feat not beyond them), as the security systems of the containment facility have been disabled and the Flood has already found a means to escape the containment facility. Also, taking into account the fact that the control room seems to be on the opposite side of Halo to the map room, and thus presumably would have taken Echo 419 some time to get there ... the time frame seems reasonable enough. While admittedly this theory doesn't explain the security doors in the Library (perhaps they are not connected to the rest of the network, thus the Monitor must access them himself. A reasonable enough security measure), it does go a long way to explain the circumstances in which the Flood were released (though this could be explained in Halo: The Flood. I haven't read that yet). I suppose this could also add more fuel to the theory of Cortana being an 'escaping convict'. Cortana essentially released the Flood, or at least used you to do it. Some great points concerning Halo's girth, those dastardly blue beams, and the Manufacturer's Recommended Operator Size for Installation 04. Some things bother me about all this. The first one is mass. Consider the size of Halo. Halo has to be made from incredibly dense material, or it would not survive out there. Multiplied by the sheer size, where did all this mass come from ? There have to be enormous patches of space out there devoid of mass. Since the area where Halo is located still contains plenty of it (a gas giant and a moon for starters), all this mass would have been transported to the construction site (not nessecarily phisical transport, may have been through an energy conversion cycle or whatever). Secondly, energy. The construction energy balance alone would be mindboggling. This energy did not come from mining the gas giant. It would have been depleted many times over. The basic idea of a ringworld is for it to be constructed AROUND a sun (which would make it WAY bigger). Since Halo is not, it would have to rotate to be able to have a day/night cycle thus periodically exposing evrey area to sunlight, gathering energy (the large beams could be used to transfer energy from the 'day' side to the 'night' side. just a thought). Internal size. All service tunnels are 'human' sized. Flood as well as Covenant are essentially human sized. Bipeds. All creatures are bipedal, walking upright. The whole control panel layout is tailored for manipulation by human sized bipeds with 'hands'. Does this tell us anything about whoever constructed this? The blue energy pulses as an energy equalization or distribution system is unique, perhaps for both other systems as well as climatic control. Peter R., concerned this time with the Forerunner's title, or lack of it. Forerunner(s). That's no name for a race. It's a term used by later generations of intelligent life, who have first forgotten all about the existence of another form of sentient existence that came before, and then rediscovered the existence of something that came before, but haven't quite figured out everything about it. No live species would cale itself 'forrunner(s)'. That term would be reserved for whom/whatever came before them. Since not even GS seems to know what they're called. one could argue he's from a different timeframe altothether. Or, no name was thought to have been required, by either 343 Guilty Spark or by the Forerunner themselves. As the Elites so steadfastly hold, a name implies legitimacy; in another sense, it also implies that there is something else that the named object is being contrasted with and discerned from. If the Forerunner were possibly the only sentient/sapient race at one point in history, perhaps naming themselves seemed entirely superfluous? ok so i read this book by William C. Dietz; it was called Legion of the Damned. it wasn't that good but had many similairites to HALO. the warriors were called TROOP II's. need i say more. but what interested me was the Hudathans (nicknamed geeks). they were also wiping out humanity across the galaxy. they also were very technologically advanced. but what intrested me was the reason for them attacking humanity. they were basically paranoid. there own planet's sun was going to explode, so they moved out of system. but since they were so paranoid, even though they are utterly invincible, they destroy all those that could cause �them harm �before they even have a chance to do so. the geeks have a lot of similairites to the covenant, maybe the same reason for attacking us. they also declared it� a religious war to make it "just". Umm.... Guys, I 've got an idea bout how 343 got all his info about the PoA and her systems. Alright, here I go. If the Cole Protocol was used there would have been nothing left right? I was reading the Fall of Reach again a couple days back and i go to the part where Capitain Keyes is on the Pillar of Autum for the first time. On page 273 Hikowa mentions that the Pillar of Autum has more that one AI. "We've got more than that sir," Hikowa replied "Cortana is running the shakedown and supervising Dr. Halsey's modifacations to the ship. We have a second AI to handle point defense." "Really?" Keyes was surprised; getting a single AI was tough enough these days. Getting two was unprecedented. Among the Science fiction that Bungie says has influenced them is the book Ringworld by Larry Niven. In Ringworld's sequel we discover who built the Ringworld. If you are plannig on reading either of these books(and they both are very good and worth your time) then you might not want to read this as it will proberly contain spoilers. Well in the books the race that created the Ringworld are the "Pak" a technologically advanced but warlike race. Well the Pak have 3 growth stages child, breeder and then Protector(this is also the title of another Niven book which describes the Pak, this is also a very good book and worthwgile read).At some point the Pak stopped making war with each other long enough to send out a colonisation ship. Eventually this ship reached the solar system SOL. However the Protectors attempts to "evolve" the breeders into other Protectors failed as the plant they used to transform them, wouldn't grow correctly in the soil of the planet they landed on. So without their plant "tree-of-life" no more Protectors could be made. Eventually the not-quite-sentinent breeders evolved into us, human beings. So maybe the forerunner are like the Pak and we,the humans, are their less intelligent cousins. Although perhaps rather than having a missing growth stage perhaps the forerunner were something like the MC; genetically changed to be stronger, faster, smarter than the average human. It has been hypothesised by many before that Humans could be descendents of the Forerunner, one reason why the Covenant hate them so much. Whilst reading through Halo: The Flood, the following events caught my attention. 1. Chief says that he always 'feels' like he knows which buttons to press on Halo's control consoles and describes it as an instinct like the "fight or flight" response. 2. When the Chief gets into the long snow valley sections on Halo. He says that he felt a strong feeling that he was finally home. Another connection to the human 'instinct' (or should I say forerunner instinct) of being familiar with Halo. 3. When the sentinels first appear in the swamp, the marines first instinct is to shoot at them. Master Chief however says to wait and see what they do. This is a major change in thinking as throughout the Fall of Reach and The Flood he constantly is taught and uses the "kill now, ask questions later" maxim. Again this is another example of his instinct regarding Halo's technology. These support the views that either humans are derived from the constructors of Halo OR that the Forerunner implanted information into the human psyche i.e. Covenant get the technology, humans get the knowledge to use it. So, in the same way that Guilty Spark recognizes our armour as a Forerunner (or similar) derivative even though it is second generation (Mjolnir is based in turn on Covenant tech), can the Master Chief (or other Humans even) utilize Covenant tech more efficiently merely because it is, itself, based upon Forerunner design? Further comments on the Chief's repeated "intuition" regarding Forerunner symbols and technology. It may also be possible that the physical and (more than likely) mental augmentations (such as the neural implant upgrade) done to the Master Chief enabled him to ascend to a state of subconcious awareness and tap into his repressed...well...Forerunnerness.